Ooo Lookey! Where I should have posted it in the first place! OK. Working on the Stained Glass to go in the Mauritania doors/windows. I've worked on these all weekend, and I'm wondering how much further to work on them. The glass mesh is actually bevelled - which plays a little havoc with the leading. The back glass is not frosted, but it is textured. 1. Do I spend more time on the anti-aliasing to make the leading smoother, or just leave it at that. 2. The Rose looks fine where it is on the vertical door, less fine on the horizontal window. 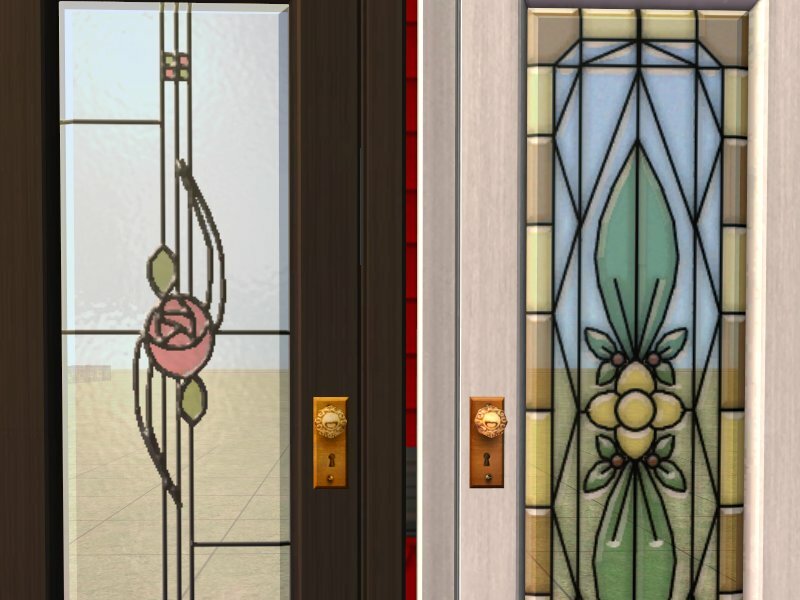 Should I make a similiar one with the rose moved further down, so that the windows look better - or make a glass panel that actually is just for the window (so same motifs, different pattern). 3. 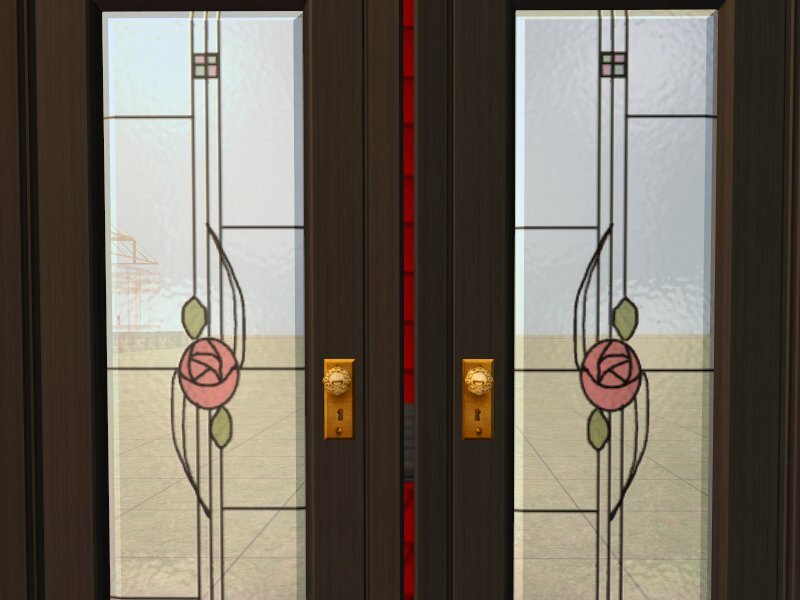 Does the pattern need to be flipped to make the double doors look like the patterns facing each other, or are they ok like this? 4. Is having the leading look 3D worth the pixellation on the curves. (It would be less pixellated if I left it as a vector and flat black). (For comparison - the normal stained glass on the Mauritania door has flat leading). I have a few more stained glass to do - so decisions made here will affect them. Also while these stained glass have been found on the internets, I've made them from scratch, so I can move the elements of the patterns around no problem. 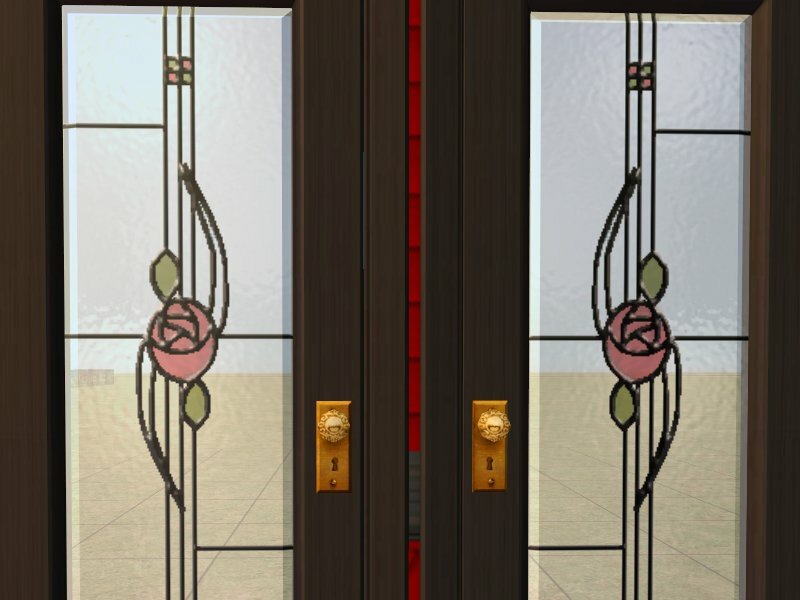 IMO the rose need to be centered on the windows, the door positioning looks great. The roses on the double doors don't have to face each other, looks good the way it is. You could always try shadows with the flat black leading to make it look 3D'ish or maybe a bump map, that might get rid of the pixellation on the curves. Kiri I love, love, love Rennie Mackintosh designs I'm with Chelle on the window placement of the rose. Can't comment on the technical side cos i don't have any experience there. I agree with previous speakers, the window rose would look better if it were centred. Personally, I'd prefer more anti aliasing and less 3D on the doors, but that's me. Re the bump map suggestion, unless the mesh is bump map enabled already, any bump map you add won't display correctly - or rather, it won't display at all, the texture will still look un-bumped. I have no idea whether or not these doors are bump map enabled; only way to find out is to add one and see if it works. Yeah... I don't believe it is bump-map enabled, however I will have a look and see what I can achieve. Window Rose centred - yup - I think I will also rotate the rose 90degrees as well so that it's upright on the windows. OK - Going back in to make this more beautiful... wish me luck! Honestly, these issue are why I don't use the Mauritania set very often. 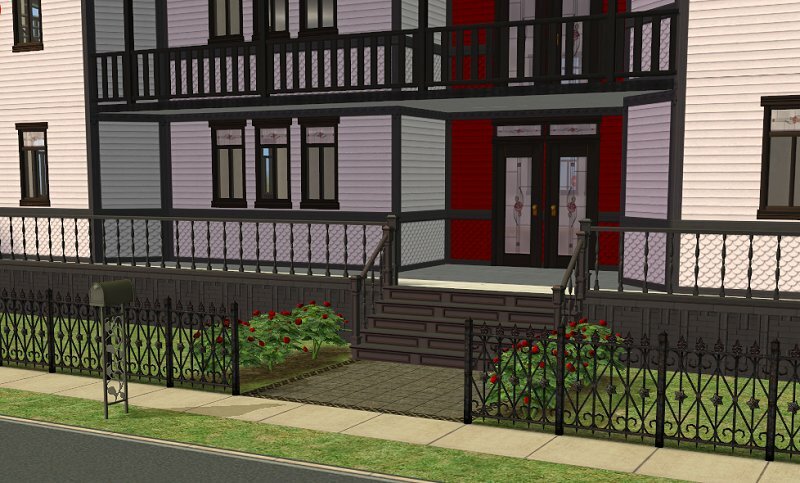 The existing recolors all seem to have the problem that they don't look right on the windows and transoms. And the issues about beveling, and the 3-D appearance of the leading -- well, suffice to say that you're doing better than others have done, already. I agree, and I made that window set. I knew at the time that off center images would never look that great -- but the game ones do, and yea, it is a restriction of making it repository. This is the first time I've used this set, and I'm going to use it more - I just wish it had matching arches with stained glass in the overhead. I have no problem making it symmetrical - and yeah the games one look great in it. It's one of the things that attracted me to it. Ritaxis, I get where you're coming from. But you know me - I tend to take my time on things until I get it the way I want it. I've made the leading 1 pixel thinner (2 wide instead of 3) to cope with the lack of 3D-ness. And I've moved the rose further down so the pattern is mostly symmetrical. It's certainly less pixellated now. I think that will have to do, although I may fiddle with it later. The rose on the windows looks perfect now, I thought the positioning of the rose on the door looked great before, I have to say it looks even better now. Now if only I can remember why I think I've seen arches like this somewhere. Buggar! my brain is like a filing cabinet....with a lock on it, one day I'll find the key.